Finally, some relaxing moments for the Dhoni Fans, as the Old man once again proves that he still got it. 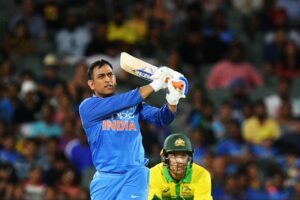 Dhoni smashed an unbeaten 55 runs with a six in the final over to take India all the way to the victory in the second ODI match. India wins the second ODI match and the ongoing series between India and Australia is now leveled up with 1-1. Earlier on Australia set a total of 298 for 9 in the 50 overs after winning the toss. The Kangaroos innings was powered by a whooping 131 runs from Shaun Marsh who hit 131 with 11 fours and six huge sixes. However, India started in a slow motion with Virat Kohli building up the Indian innings with 104. However, after Kohli’s departure, the responsibility fell on Dhoni’s shoulders. Our old man, once again proved his class and showed his critics that he has still gotten it. Dhoni just rotated the strike with Dinesh Karthik who scored 25 runs at 14 balls. Before this match, MS Dhoni was being criticized for poor strike rate. However, with his classic form he took India to the victory. Now, India will play the final series decider third ODI match against Australia at Melbourne Cricket Ground, Melbourne on 18th January.